If you're looking for engagement photography in the Front Range area, there are so many options to choose from. As an experienced photographer in the area, I can help you find locations that speak to your personalities and your love story. Whether you'd like some rocky backdrops because you love climbing or hiking, or a park setting with more greenery in the spring and summer, there are no shortage of places in the area. I usually photograph my sessions from Fort Collins to the Denver area and west towards Estes Park, but I'm open to ideas of what works for you as well. Since I live in Fort Collins I know this area like the back of my hand, and can find any backdrop to suit your style and likes. 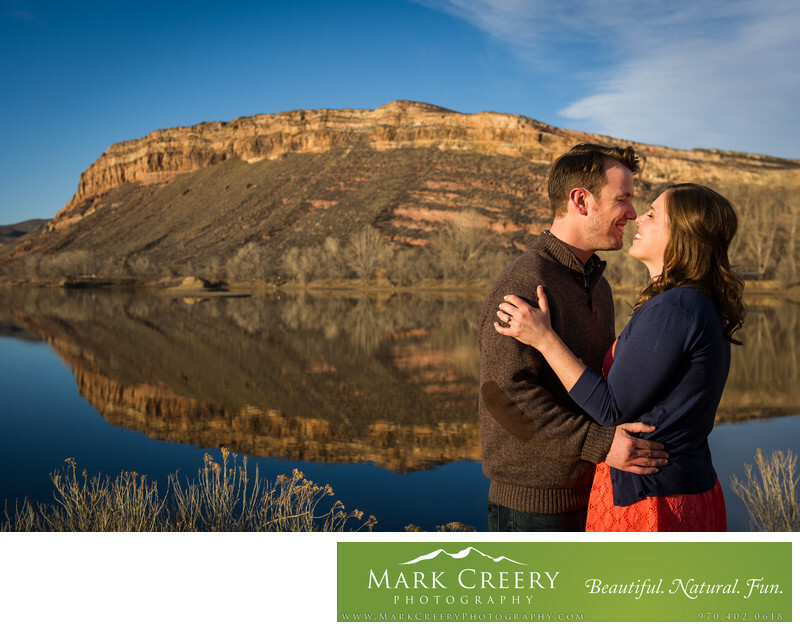 In this engagement photo, we did an early Spring session on a beautiful blue sky Colorado day and found a great area that I like to use, with a lake and hogback cliffs and a river. The stillness of the day allowed for a perfect reflection of the rocks in the water. But like all my photos I wait for that perfect expression to come naturally from my couple as they interact and have fun.